Riding in a taxi to the Tel Aviv airport after a week in Israel, I realized with a start that I forgot to have lunch at a falafel stand. We had stayed with friends in Jerusalem, where my husband led several workshops, and mostly ate simple meals at their house or went out to wonderful Arab restaurants (like Amigo Emil and Abu Gosh). But the ubiquitous fast food sandwich eaten standing up in a corner shop had somehow slipped my mind. Luckily, the East Bay offers plenty of places where I could make up for my gustatory oversight. 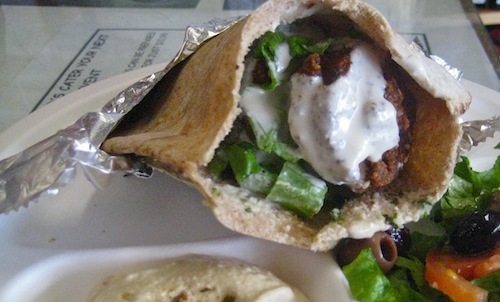 But hold on just a moment — because, as I learned, falafel are not just a tasty stuffing for a pita pocket. 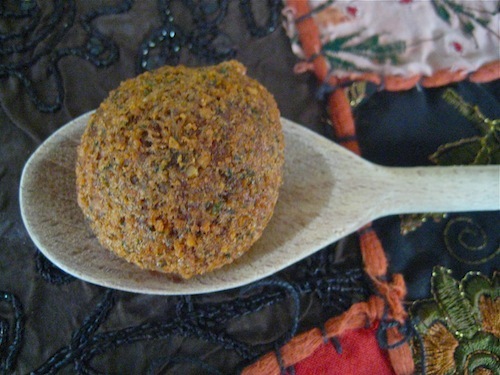 The unpretentious, flavorful little ball of smushed chickpeas and spices is actually the source of a bitter dispute between Israelis and some of their Arab neighbors. Emblematic of the larger battles over land, history and power, both sides claim it as their own. A NY Times article by Jodi Kantor cites the fact that falafel (which can refer to the fried balls themselves or a sandwich that incorporates them) is often called Israel’s “national snack” and featured on publicity posters and postcards. This inflames some Palestinians and other Arabs and has even led to an international lawsuit against Israel by Lebanon for violating a food copyright. Dishes made with chickpeas (aka garbanzo beans) date back thousands of years. 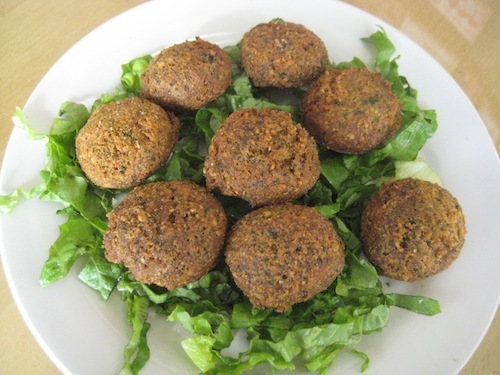 Many believe that early Egyptian Copts (Christians) created chickpea or fava bean fritters for meatless Lenten meals. They have since been prepared all over the Middle East by Palestinians, Syrians and Lebanese (including Egyptian and Syrian Jews). In the East Bay, my favorite version of the falafel ball itself is found at Zands, an Albany market and deli that specializes in Persian, Lebanese and other Middle Eastern foodstuffs. Their falafel are golden and crispy on the outside without being dry on the inside. Owner, Monier Attar, who is Persian, did not grow up eating falafel, but a chance encounter with a kindly 85 year-old Egyptian woman, whose sons ran a San Francisco falafel stand, changed her life. After Attar followed an enticing aroma, saw a line snaking out the door and tasted the heavenly falafel, she asked the old woman for her recipe. The secret is adding the traditional Egyptian ingredient, yellow fava beans, to the mixture. Now Zands is famous for their falafel sandwich — a simple combination of pita, falafel, lettuce, tabouli, hummus and tahini sauce – that lets the taste and texture of the crunchy orbs shine through. To make falafel, the chickpeas are not cooked, but soaked in water overnight, then ground with various combinations of parsley, cilantro, garlic, cumin, coriander, lemon juice and baking soda and fried till crispy. Many groups cherish them as a nutritious, versatile and cheap vegetarian meal. (recipe link follows post). 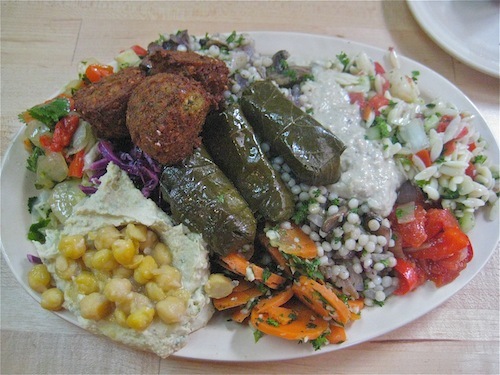 While Arabic cuisines generally serve falafel balls alone or wrapped in lavash bread, part of the fun in a traditional Israeli-style falafel stand is the addition of a range of pickles, beets, peppers and chopped vegetable salads squished into the pita cradle along with the falafel balls. Amba, a new kosher restaurant in Montclair, (whose chefs trained at the Jerusalem Culinary Institute) boasts a wide range of choices, including hummus, Moroccan carrots, eggplant or pearl couscous with mushrooms. If you can’t decide which to add to your pita, order the mezze platter and get a sampling of all of them. 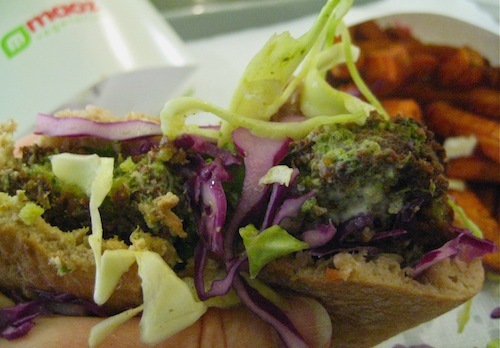 To my taste, the perfect Israeli-style falafel place is Maoz, on Telegraph near Cal, part of a worldwide chain started in 1991 by two Israelis in Amsterdam. 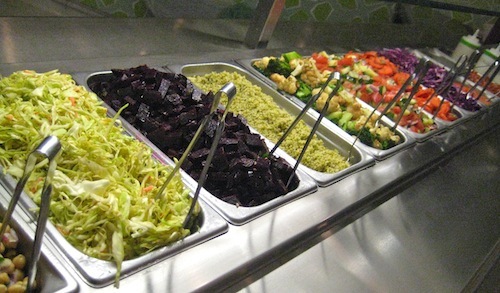 In a spotlessly clean, brightly tiled interior, their salad bar seems to cover a football field with beets, flash fried broccoli and cauliflower, green and red cabbage, the classic tomato/cucumber mix and more. And the best part: you get to come back to add salads to your falafel as many times as you want. So even the last bite can have the perfect balance of mush and crunch. They also do a mean bag of sweet potato fries. — Falafel is not the exclusive property of Lebanon, and it has never been patented by Lebanese as their own. There is no proof it comes from Lebanon in particular. In fact, it appears to have its origins in Egypt, from which it migrated to Syria. — Falafel has been around for thousands of years before Christ..it was invented by the Lebanese Phoenicians and passed on to the Pharaohs of Egypt..Israel only recently in the last 50 years stole it and began to market it as their own..there is nothing wrong with creating a cultural melting pot of food, but give credit to the true inventors. — Who cares? It is all Middle Eastern food. And we all like it; now if we could just get the nuts on both sides to shut up we all just might get to sit down to dinner together and work out a real Peace Plan. — Food does not belong to anyone, you idiots. This entry was posted in Egyptian food, Israeli food, Lebanese food, Middle Eastern Food, vegetarian ffod and tagged Amba, falafel, Maoz, Zands. Bookmark the permalink. Ohhh. another post that’s leaving me hungry! I’ve eaten at Amba but will have to try out Maoz. east besides the ones that immigrated to Israel. I have to imagine those mizrachi Jews must have had a long tradition of frying up falalel as well. Good point, Faith. You’re right. Many of the commenters among the 109 I mentioned also brought that up. You left out Sophia’s Cafe, in Albany, which is just down the street from Zand’s. Thanks for sharing that info, Robert. I’ve never been there. Will have to try it.